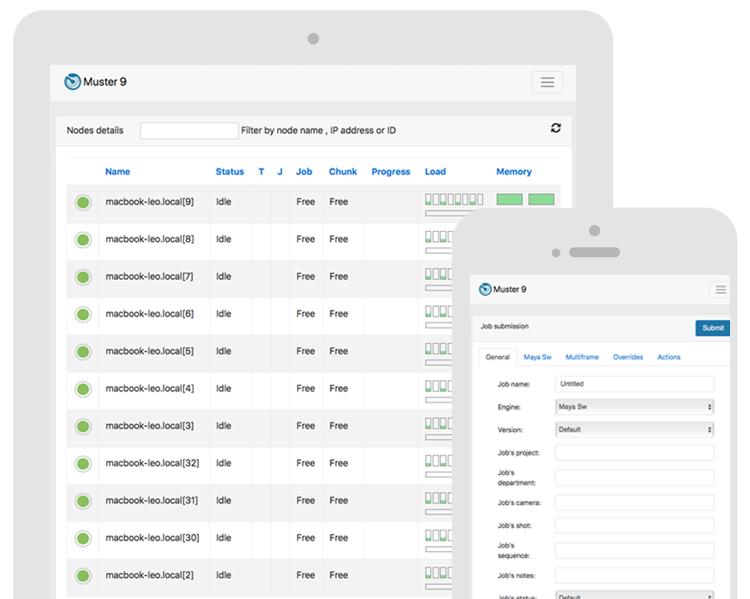 Muster is a next-level Renderfarm management system. Muster 9 is our software to provide a clean and powerfull system to manage CGI Renderfarms and distributed computing. It has a wide range of incredible features, a clean interface and an huge amount of customizations facilities. Easy for Wranglers, powerfull for pipeline’s developers. Muster includes an integrated web server engine that’s the core of our HTTP/Rest APIs but also exposes a minimal, clean, and intuitive web based interface to its core features. A foldable hierarchical tree view of your queue jobs. You can drag and drop jobs to nest them into folders, chains dependancies, and get a visual resume of what’s going on your farm! We made our best to keep you inside the Muster interface. That’s why the latest version ships with an integrated free, OpenGL accelerated image sequences viewer. It supports HDR natively accepting openEXR images as well as standard image formats like PNG, TIFF, Maya IFF, BMP, TGA, JPEG, RLA and SGI. Not enough ? The image viewer is tightly integrated with your Muster jobs. Are you browsing a bad frame ? With just one click, you can send back your frame or a job’s chunk directly into the Muster queue to get rendered again! In 17 years, we realised that the most important aspect of a Render farm manager system is its error reporting tool. That’s why we have rewritten it from scratch and made a totally integrated system that keep tracks of any error or warning you get during your renders. Always! Any time you get back to our old jobs, you have a precise list of your errors and warnings, their lines numbers, and the original log file. You can also override globally or on a job basis, what you consider an error or a warning, using clear texts finds or regular expressions! You gain precise control over your jobs and stay sure that if you get an error, this is something really important to check! You deserve to stay away from your systems and be sure everything is running smoothly. That’s why we have rewritten our notifications system to let you select exactly what notifications you really need. Also you can deliver notifications on a user or group basis, the system is completely integrated in our users management feature and let you take total control over them. Emails, Muster notificators, and soon, mobiles devices. Everything is under control and totally customizable! We missed something ? CUSTOMIZE! Everything is Python here! To support external engines, we use Python 3.3. Our templates system let you build beautiful integrated GUI components and bind Muster with whatever engine you like. You’re not tied to image rendering, you can bind EVERYTHING, running it as a job for a single node, or as a broadcast job. The template system let you script basically any aspect of a job submission, you can also modify the existing templates to put your own behaviours and checks inside the existing implementations. SCRIPT ANY COMPONENT! INSIDE MUSTER! Muster is made by several key components, the Dispatcher service that orchestrates everything, the Renderclient service, that needs to be installed on each node you want to be controlled from Muster, and our GUI, the Muster Console. Using the builtin Python capabilities, you can script any of those components changing basically any behaviour of Muster depending on your needs! Are you worried about testing, copying and delivering scripts across your entire farm ? Do not worry, we provide an integrated Python code editor that let you push your changes automatically across the entire nodes cluster. Also, when writing scripts for Muster Console, you have access to QT the world’s best multiplatform GUIs tool. By using Pyside and Python, you can write your own GUI interfaces integrated inside Console! Do you need to integrate an external system ? No worries, you have a plethora of options by diving into the Muster APIs and command line facilities. First, you can use mrtool , our command line based control tool for Muster. It has tons of options and let you do basically anything from querying to control Muster itself simply from a command line. Not happy ? Well, we provide bindings for the Muster APIs, and they are available for C++, Python 2.7, Python 3.3, Java and .NET. Also we provide the interface files for SWIG, the tool we use to build the bindings, that means you can own compile bindings for basically any available language on the earth. Do you think C++ is hard ? Well, mrtool is completely open source. Are you ready to try Muster ? The free evaluation version comes with up to 4 nodes unlocked, if you are a small studio you can use Muster with 4 external rendering hosts for free, forever! Do you still have questions? Fell free to contact us for further information!